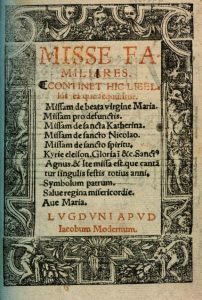 Morales based his Missa Mille regretz on neither a piece of sacred polyphony nor a Gregorian chant, but rather on a melancholy French love song. 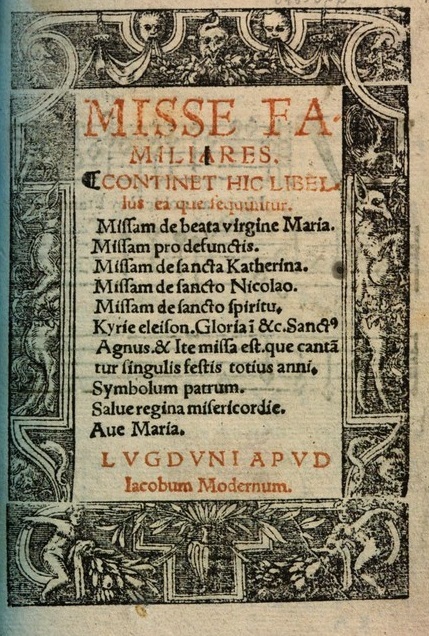 Widely popular in the first half of the sixteenth century, Mille regretz was reputed to be a particular favorite of the Holy Roman Emperor, Charles V (1500–58). 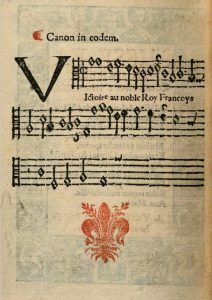 In 1538, the Spanish composer, Luis de Narváez (1500-c. 1555, referred to this doleful song as “La canción del emperador” (“The emperor’s song”). 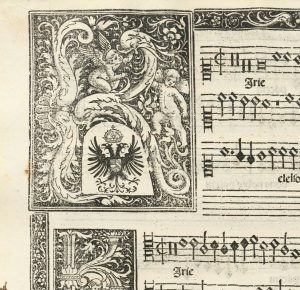 And in the original 1544 Roman edition of his mass book, Morales and his printer Dorico made the same point typographically, by inserting a vignette of the Emperor’s emblem — a bicephalous eagle — into the opening decorated letter “K” of the Missa Mille regretz. Comparing Dorico’s “K” initial (Figure 2) with the image above (Figure 1), we see that, once again, Moderne took his cue from Dorico. 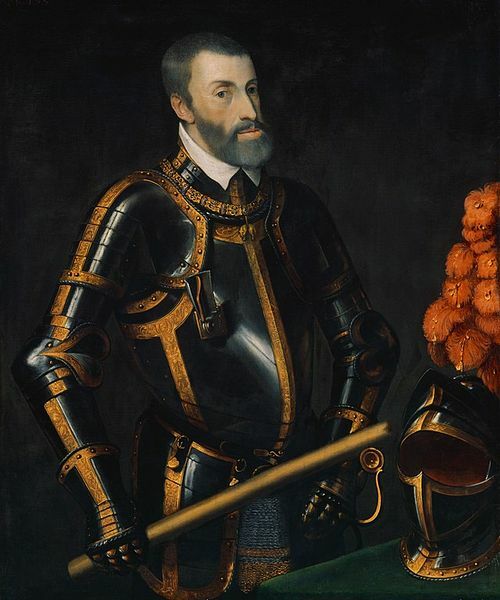 Charles V was not only holy Roman emperor, he was also king of Spain, and Morales was therefore Charles’s subject. Moderne however, since settling in Lyon, had become a patriotic subject of the Emperor’s hated enemy and rival, the French King Francis I (1494–1547). Accordingly, Moderne wisely introduced a small novelty into the small letter “K” at the foot of the right-hand page: the French royal emblem, the fleur-de-lys. 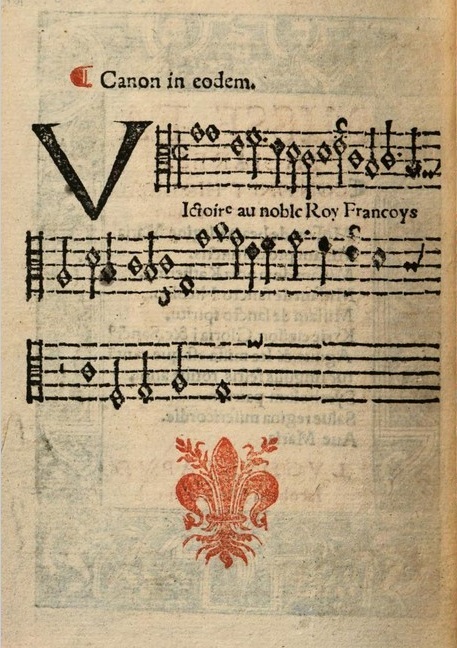 A well-known polyphonic setting of the song was attributed to Josquin des Prez (c.1455–1521), though he almost certainly did not compose the original tune. 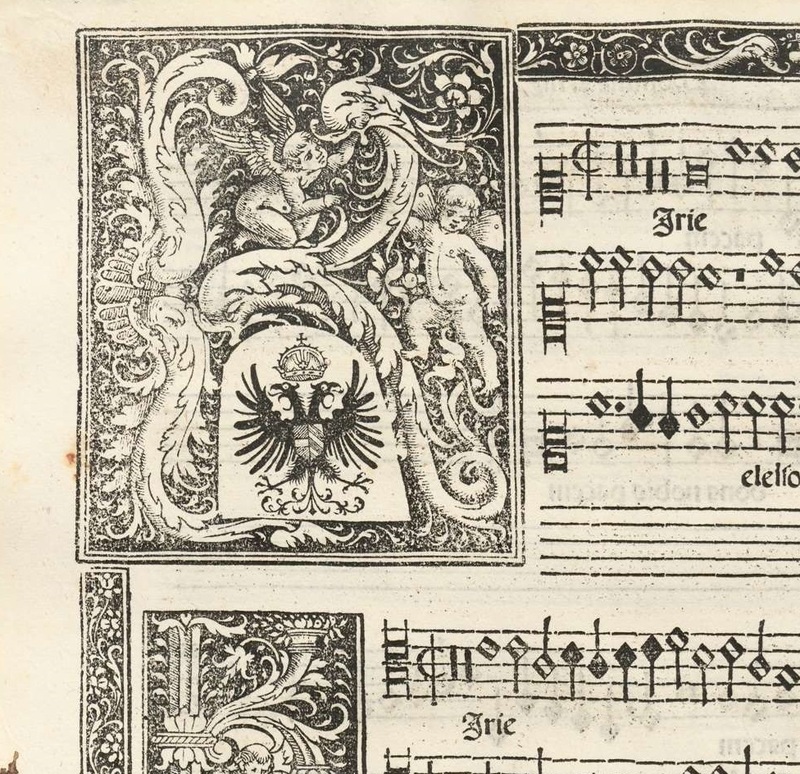 Morales quoted this tune, almost note for note, in the tenor voice at the opening of his mass (see illustration of opening from Moderne volume below), merely replacing the original secular French words with the sacred Greek text Kyrie eleison (Lord have mercy). Perhaps even more important than quoting the tune in his Kyrie, Morales sets his entire mass in the same somber, predominantly minor mode. It lends an unmistakable melancholic charm both to the song and to the mass. 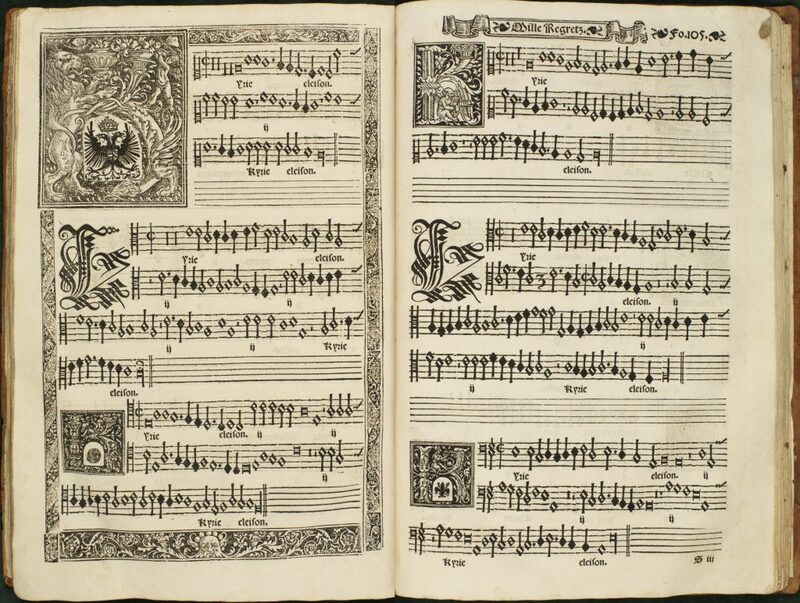 In re-composing the song as a mass for six voices, Morales may also have known and had in mind the elaborate six-voice setting of the chanson by Josquin’s pupil Nicolas Gombert (ca.1495–ca. 1560). 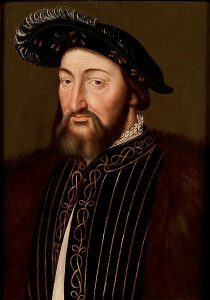 Gombert, moreover, actually worked during the 1530s as a musician at the court of the music-loving Charles V, so the six-voice setting may well have been performed for the Emperor himself. 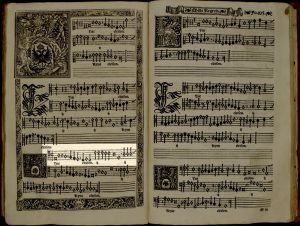 Morales, too, chose to compose his Missa Mille regretz for six voices, two in soprano range, two in alto range, a tenor, and a bass. 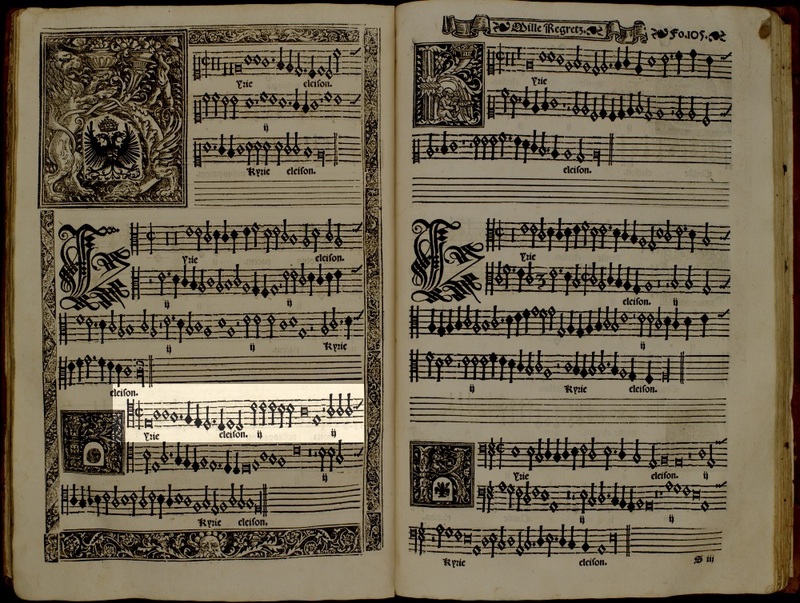 In choirbook format, each voice appears consistently in the same sector of each double-page opening. 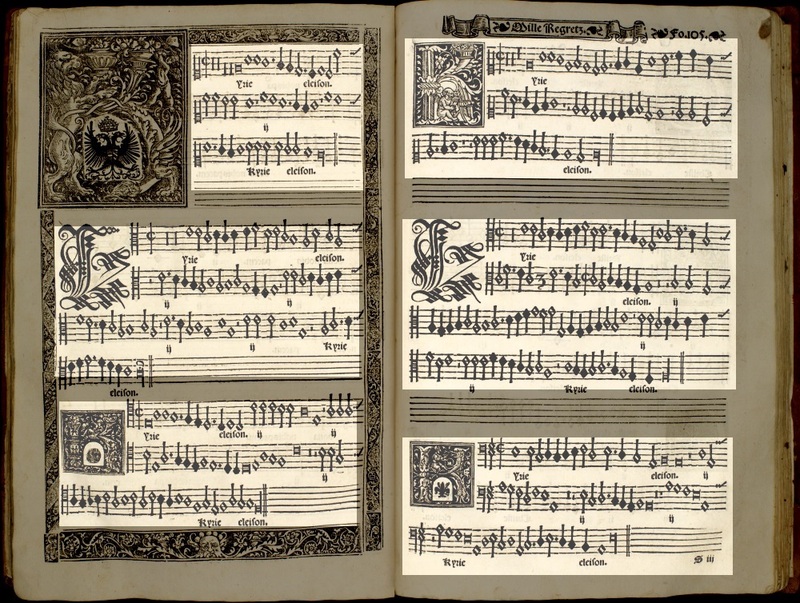 In the following image of the first page opening of the mass from the Moderne volume, the two soprano voices appear opposite each other at the top, the two alto or high tenor voices below them, a low tenor on the bottom of the left-hand page, and the bass at bottom right. The main outer sections of all the movements of the mass are sung by all six voices. 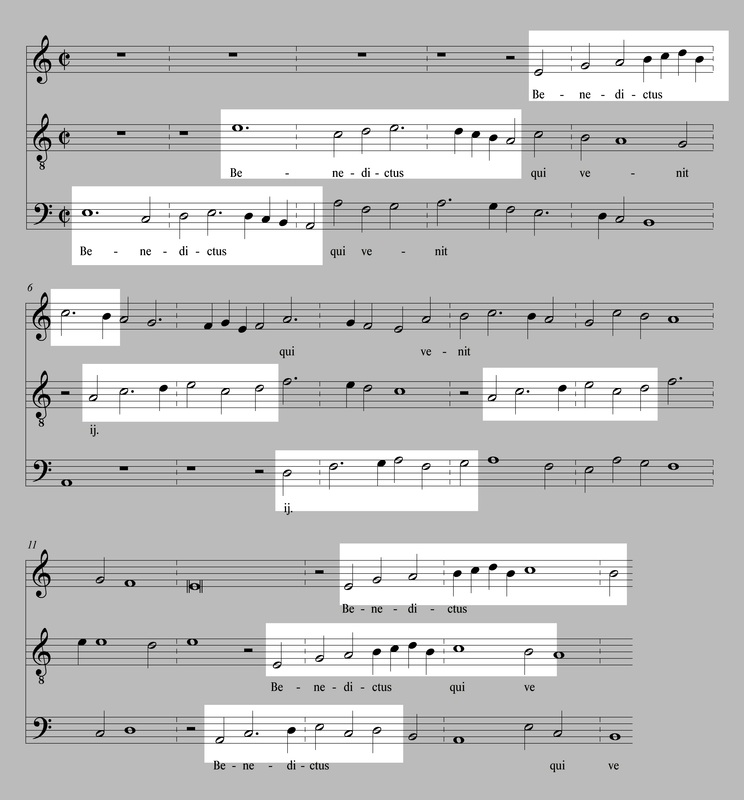 However, Morales often scores certain internal sections for smaller combinations of voices. One such section is the Benedictus, the section sung by members of the Ensemble Plus Ultra in the video below: Benedictus qui venit in nomine Domini (Blessed is he who comes in the name of the Lord). The Benedictus is sung by three of the six voices: a trio of one soprano (top left, in the image below), one alto or high tenor (top right), and one bass (bottom right). Meanwhile, as seen in the following illustration from the Liber primus missarum, a verbal direction Benedictus tacet instructs each of the other three voices to remain silent until it is time for them to join again in the next section (Osanna). 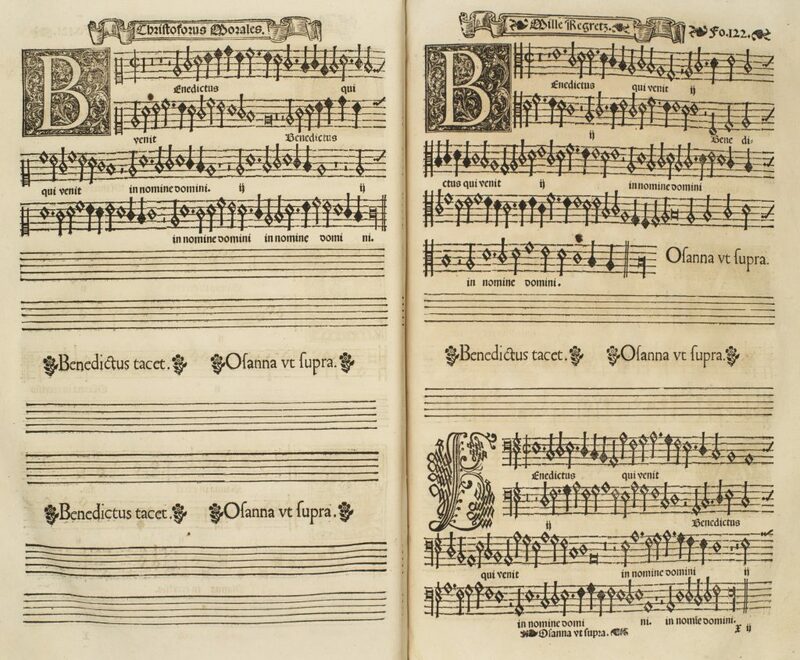 Here below is the opening of the Benedictus, in modern notation, with the three separate voices scored together. The Ensemble’s performance may be followed first with the opening extract in modern score below, and then with the original sixteenth-century notation above. Morales creates an imitative polyphonic texture by sharing the same small melodic figures, or points of imitation, among all three voices, layering and superimposing them in inventive ways. The bass begins with the first of these figures (A). It is then imitated by the tenor. 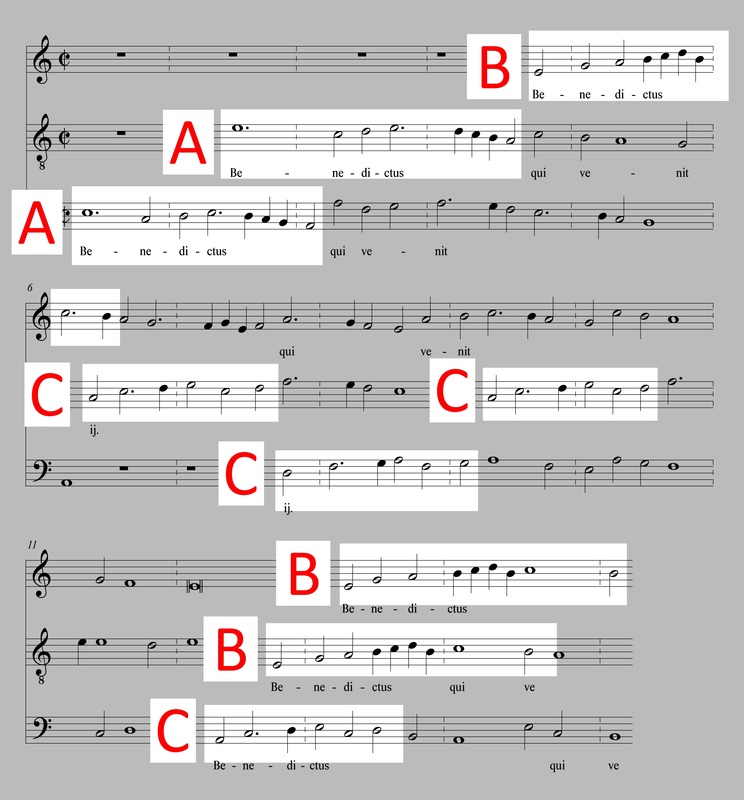 The soprano next enters with a new figure (B), that is not copied immediately, but is sung again twice later by the tenor and soprano, combined simultaneously with the third figure (C) sung by the bass.